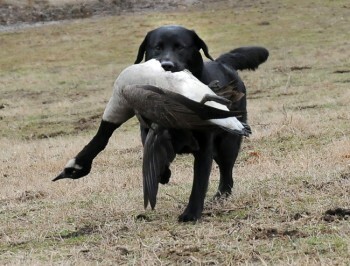 The OFA March Champion of Health is the Labrador Retriever, GCH POPLAR FOREST PLAY IT AGAIN SAM UD RE MH. Sam is owned by Phyllis Giroux, DVM and Jack Jagoda, and has the distinction of being the ONLY Labrador to have achieved the AKC titles of Grand Champion, Master Hunter, Utility Dog and Rally Excellent. 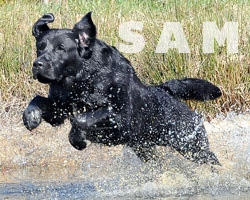 In addition to excelling in both the conformation ring and in the field, Sam has also achieved success in the rally ring with a Rally Excellent title, and in obedience with a Utility Dog title. On the health front, Sam comes from a long line of health tested and titled dogs, and has himself obtained a multitude of health clearances which include: OFA Excellent Hips, OFA normal elbows, a normal cardiac evaluation including echocardiogram, a normal thyroid panel, and a normal eye exam. In addition, he is DNA tested Clear for Exercise Induced Collapse, Centronuclear Myopathy, PRA, and RD/OSD. He has met and exceeded the health testing recommendations of the Labrador Retriever Club, and has been issued a CHIC number. Sam’s dam was also a CHIC dog, and Sam has sired 14 CHIC offspring. At the age of eight, Sam is still competing in multiple venues and hunts regularly. He is an outstanding example of a dog conforming its breed standard, that can do the job it was bred to do, that is healthy, and most importantly is passing along his health, longevity, working aptitude, and beauty to his offspring. We are proud to feature him as another OFA “Champion of Health”.